Put your confidence in a service in Shaftesbury with a customer satisfaction rating of over 96%! Q: How is your window cleaning Shaftesbury going to restore the transparency of my windows? Internal window wiping – The experts will remove dirt with ladders and sponges. Q: Can you rinse my windows during unpleasant weather? A: If you spot gloomy clouds on the day of your booking, don't be alarmed. The window cleaners in Shaftesbury can still carry out the service provided they're facing a light drizzle. However, in the event of a downpour, we will kindly ask you to put off your appointment to avoid any mishaps. A: Yes, you can! The washing team will require a free parking space in close proximity to your premises (30 metres or less) and on the same side of your windows. A: It's no problem for the team to rinse the outside surfaces of your glass façade as long as they are free to enter through your front gates. And if blemishes have landed on your internal surfaces as well, just tell us and we'll perform a free key pick-up and delivery. A: We will instantly inform you about the cause of the expert's delay and notify you once he arrives near your building. A: Yes we're licensed to clean any type of pane or window part. What's more, every PVC or UPVC frame or ledge will be cleaned for free! 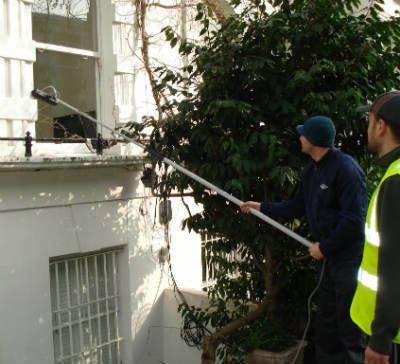 With our window cleaning in Shaftesbury, you get a meticulous clean of your sash windows, skylights, conservatory roofs, French doors, and other glass surfaces at modest prices. We will even provide you with a complimentary wash of all PVC & UPVC window elements! For a detailed list of our prices, please see our price table below. With window cleaning in Shaftesbury, we can increase the appeal of your property even if it touches the clouds above. Let's review what you'll get once you book our custom-tailored service. For external window washing, the Shaftesbury window cleaners will utilise a expandable water-fed rod. A water pump inside the specialists' van will pump filtered water up the hose and out of a brush-head extension. The water, together with the brush-head, will erase any traces of dust from the casements of any four-storey building. With rope access window washing, the pros will use safe climbing gear to reach even the highest floors in your industrial or home property. We have all required COSHH documentation and risk evaluation reports and can send them to you in a moment's notice. Moreover, we frequently check the washing gear to ensure that your booking will go without any complications. And to wipe every inside corner of your glass surfaces, the proven team will use the regular sponge and ladder cleaning approach. Do any of your family members need help with rinsing away persistent window streaks? Continue reading to learn which districts the Shaftesbury window cleaners frequent. Another quick and easy way to get a free instant quote or to book window cleaning services Shaftesbury SW11 is through our web site.